Mainlands or What’s Wrong With Second Life? Among my friends, I am unusual because I like the Second Life mainlands. I like them for what I keep hoping they can be, but I’m constantly reminded of how out of control they are. While I was revelling in Ganymede yesterday, I hid photos I shot when I adjusted my Draw Distance up to 512. I’m sorry to say the skies around Ganymede are cluttered with all kinds of objects, resulting in the look of junk. So, on the mainlands, just don’t look up I guess. The truth is, and everyone who cares about the mainlands knows this, the skies are cluttered with junk. Yes, and even those wonderful “floating mountains” are junk to some of us. Hey, I saw Avatar and I loved the floating mountains! 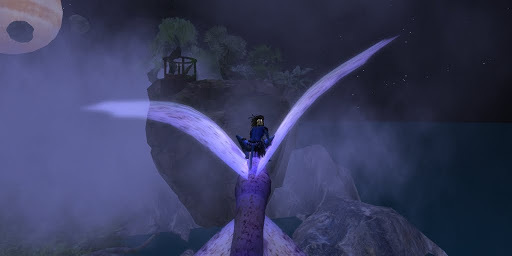 I even flew my banshee thru the floating mountains on Pandora Moon (which is kaput, btw). But, on the mainland, the Lindens could create a much nicer world if they’d just make it impossible to build items in the sky below 300m. Another thing, why do some sim owners put advertisements above their land, a practice that while clever, ends up completely hiding the map features below? You see, some of us peeps actually use the SL map feature. See, I’m cool, that’s me flying thru the Floating Mountains of Pandora Moon. But when you screw up the skies of public areas with junk, even floating mountains, you are really messing with everyone’s experience. Yesterday, I came to a fork in the road at Montara. I noticed a variety of junk piled up all around, plus signs of mischievous peeps creating objects because the land allowed it. I check for an owner because sometimes owners appreciate being told their land had been trashed, but it was group owned and apparently the owner was gone from Second Life. So, this once cute little house and barn on the Montara sim was now a junk yard. The owner is gone, the land is owned by a group with no owner and yet there it sits as “Protected Land”. Everything on that land should be returned to it’s owner, but there it sits an eyesore for all the people who like to travel the roads. I checked and the skyplatform, most of the junk in the yard and stuck in mid-air are owned by peeps who are not part of the group. There are lots of little wooden objects, the kinds left by pranksters but you can’t see them in this photo. I believe the first time I heard this idea it was put forth by Botgirl but when I went back to find the post I couldn’t find it. Regardless of who had this idea first, it is a darned good idea. Restrict certain lands for commercial use or residential use. Also, if you check it, there once was a time when the Satori continent had an Asian theme, but all of that was lost long ago. Why? Yes, it would be hard to administer, but the Linden’s need to cleanup the mainlands and zoning could help. This motorist passed me while I was hiking up the road. I saw her take a bit of a tumble as she crossed the sim border, but the point is, people do use these roads. I’m talking about those waterfronts where a developer comes in, lays down a prim slab and sells broken up parcels as land. Or worse, develops some monstrosity that blocks the view of legitimate oceanfront and near-oceanfront landowners. Lindens, take back all the ocean lands, not the oceanfronts, the land in front of the oceanfronts. Maybe allow owners 5 or 10 meters to put docks or even homes on piers, but no more of this rampant abuse of mainland oceanfronts. I’ve only touched on the problems on the mainlands. Some of us in this artificial world like being in large communities with roads that take us to our favorite places, and with residences that have a few basic rules that are enforced.Why should people have to build their own sims or even continents in order to get some order? 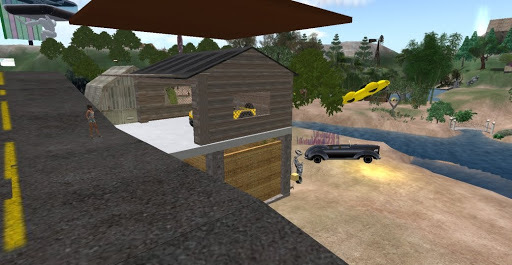 There is more than enough land in SL, there is room for people who want to live in virtual sandboxes and there is room for those of us who want to be part of virtual communities. You’ve already recognized the need for special reservations for all the people into Adult content, why is it any different to recognize that there are people where who want to have residential communities? The problem is, it is the wild west out there on the mainlands. Please fix this. Note: To anyone who feel their “freedoms” are being threatened by me stating my opinion, please just back off. This is my rant and the likelihood that anyone from LL will see this post, much less take act on my suggestions is just not likely. There it’s all done. I don’t really feel any better, but I’ve done what I can to try and get the attention of anyone who gives a darn at LL. This entry was posted in Exploring and tagged Exploring, Linden Lab, Photography, Problems & Issues, Second Life. Bookmark the permalink.